I arrived at Kings Manor, York, about ten past ten on Friday. Izzy helped me find a place to keep my rucksack safe and then we followed the others (who had been leaving just as I arrived) to the nearby Yorkshire Museum. Sara introduced us to Natalie McCaul, Curator of Archaeology who talked to us about the collections, both on display and in store, recent efforts to put the catalog on-line and the lack of money to spend on technology. Afterwards, Tara introduced me to my team-mates. More of them anon. We went off to explore the collection and see if we could find inspiration for a Jam project. First of all we headed to the Richard III exhibition to have a look at the remains of a soldier, we had some thoughts about creating something that might allow visitors to literally put flesh on the bones of his story, imagining what he might have looked like, whether he’d been a professional soldier or a conscript. These were good ideas, but the spark wasn’t there, so we went off to look at the Roman collection. Here we talked about creating a way for visitors to paint the stonework, perhaps using projection. But then we wandered among the gods. Here were stone altars and figurines and other representations of, not just the “Roman” gods, but also the other local gods that Roman culture had assimilated as it marched across Europe. There was a stone altar there that, the label explained, was a “cheap” altar, carved with simple generic icons, which a hard-up Roman might then paint to dedicate it to gods of their choice. 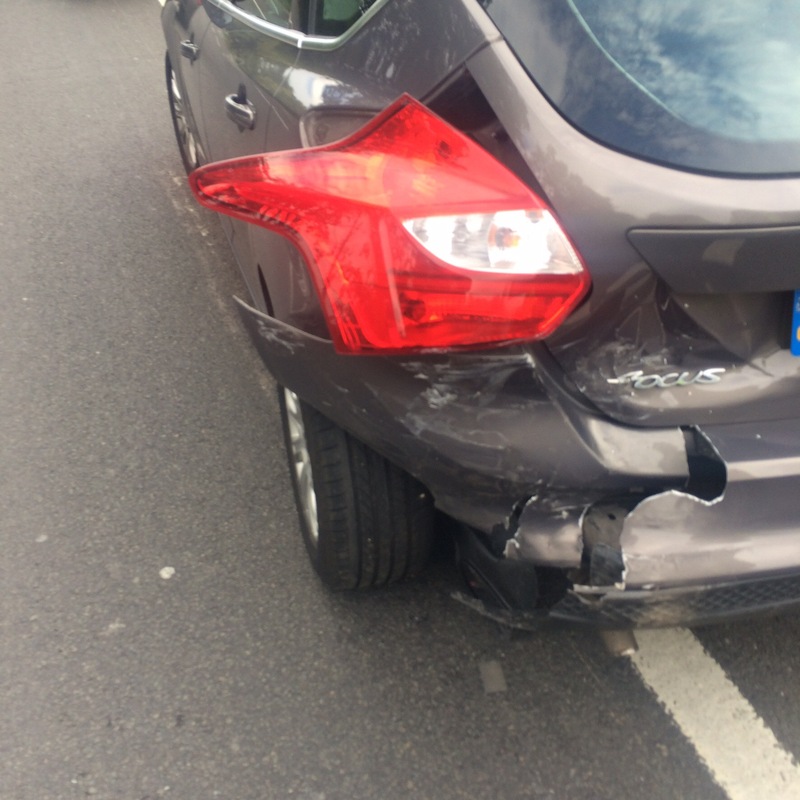 I had to take a phone call about my insurance claim, but when I came back Juan had had “the idea.” And it was brilliant! Lets take a break to introduce my amazing team-mates. I need to say now that this was the very best thing about joining the Heritage Jam. It was a real privilege to get to work with such talented people. That the sort of this people always say, but I mean it. I was humbled by the opportunity to work with them. Lets kick off with Juan, as the idea was his. Juan is a game designer, artist and PhD researcher, studying Historical Representation in Games at the University of Salford, where he also teaches computer and video game development. His amazing talents as an illustrator meant that even out earliest concept designs looked stunning. 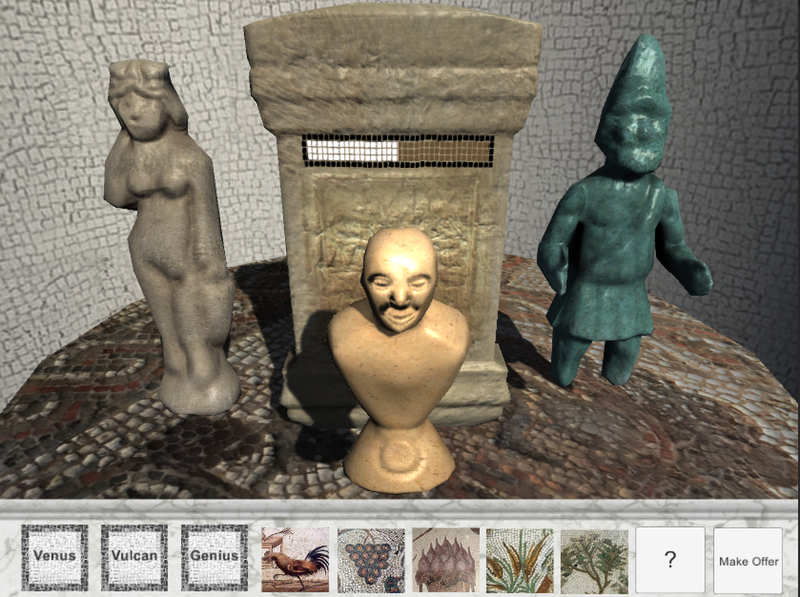 Then, his amazing talents as a 3D modeller made the final version look like … well, wait and see. Sam is a post-doctoral researcher at the University of York, currently working on a project called New Economic Models and Opportunities for digital Games (NEMOG). Sam could wrangle Unity like it was putty in his hands (mixed metaphor I know). And get this, he has also been a competitive Mixed Martial Artist! Edwige is an Associate Professor of Digital Arts at Universite de Versailles. An expert Unity wrangler herself, she also brought excellent artistic, project management and games mechanics skills to the group. Frankly, there was very little left for me to do! We very quickly solidified our ideas. 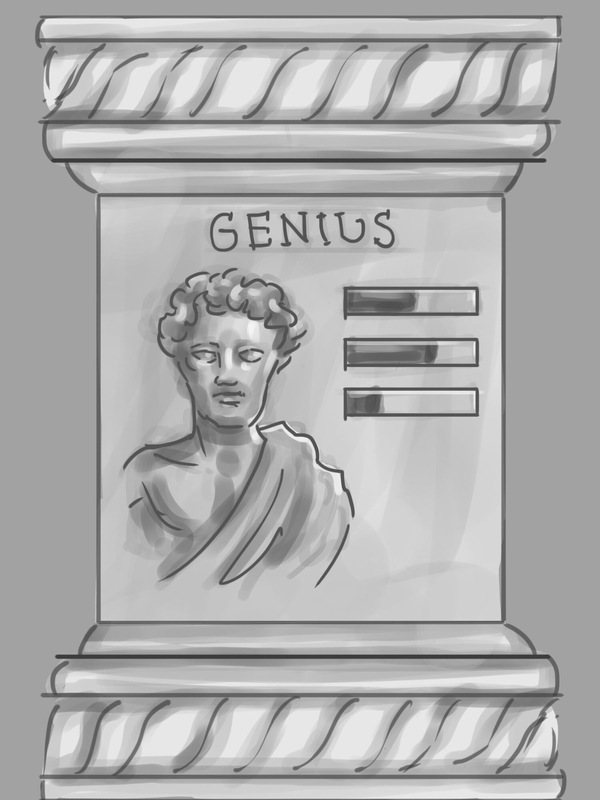 We’d been inspired by a case containing three figurines, including a very Happy looking Genius Loci, so he would be our “first level god”. 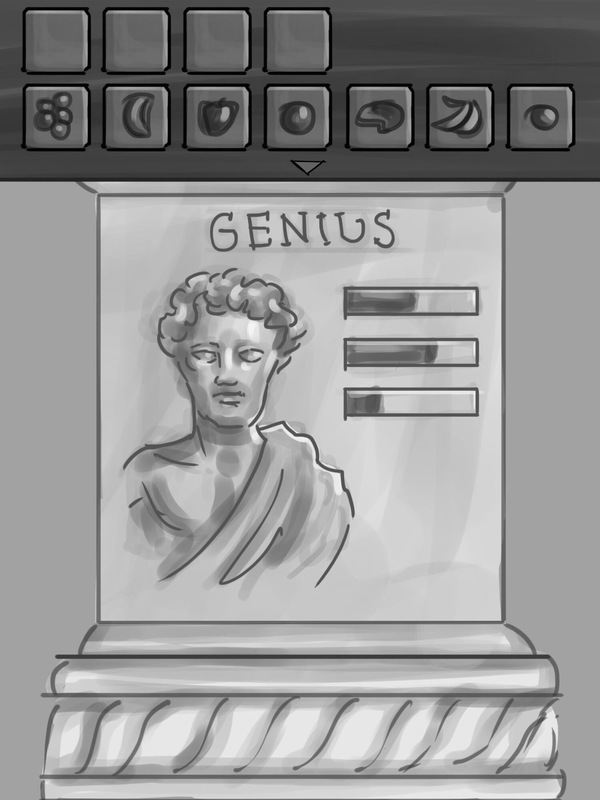 We’d keep our ambition modest and achievable though – just create that first level with his two companions in the case, Venus and Vulcan, the promise of levels two and three. Not being a roman expert, I found a paper (by Mark Robinson) on sieving and flotation analysis of biological remains from excavations below the AD 79 destruction levels in Pompeii, to discover some of what was being burned on household altars. We settled on giving the player an unlimited supply of five offerings: grapes, figs, cypress wood, grain and cockerels. But the challenge would be knowing who the god was wanting at any particular time. You had to select two offerings – choose the right combination and the god would get happier, but get it wrong and the god would get unhappy. Make the good 100% Happy and not only would you get to make a wish with a prayer offering, you’d get another god to add to your collection. You could ask the friendly roman woman Lucia (based on a popular item in the museum, the remains of a resident of roman York known locally (and online) as Ivory Banglelady) for help. But before she’d tell you exactly what the god wanted, you’d have to answer a question, the answers to which could be found in the museum, and importantly in their on-line catalog. As we talked Juan sketched out how it might look. The other three got out their high-powered lap-tops and started modelling, and coding the interface and the gameplay. Not having the skills or the equipment to join in, I got to work creating the questions for Lucia to ask. we weren’t going to need many, just for this demo, so it shouldn’t have taken very long. But as I worked I bean to get quite frustrated with the on-line database. I was working through the circa 7000 roman entries one by one. I soon realised it was very difficult to search for what I wanted if I don’t know what it was. Not only that, but the text was straight out of the museum’s own catalog. It was dry6 and academic and nothing like the well written labels in the museum itself. So after I tried (and failed) to craft questions that included enough key words that might identify the right item in a search, I realised that I needed to create a whole other layer of online interpretation. And so the happygods project blog that I’d started to record our work, was repurposed to become a support for players of the game. I wrote a new layer of interpretation that the game would refer to, if you asked for help, and which would in turn link to the relevant on-line catalog entry. Actually, that was the idea I had as I was going to bed around midnight on Friday. I resolved to actually do the work on Saturday. In truth, I was a little overwhelmed by the talents of my team-mates, and worried that I had little to add to the project. They were working so efficiently, turning Juan’s sketches into an animated modelled interface. 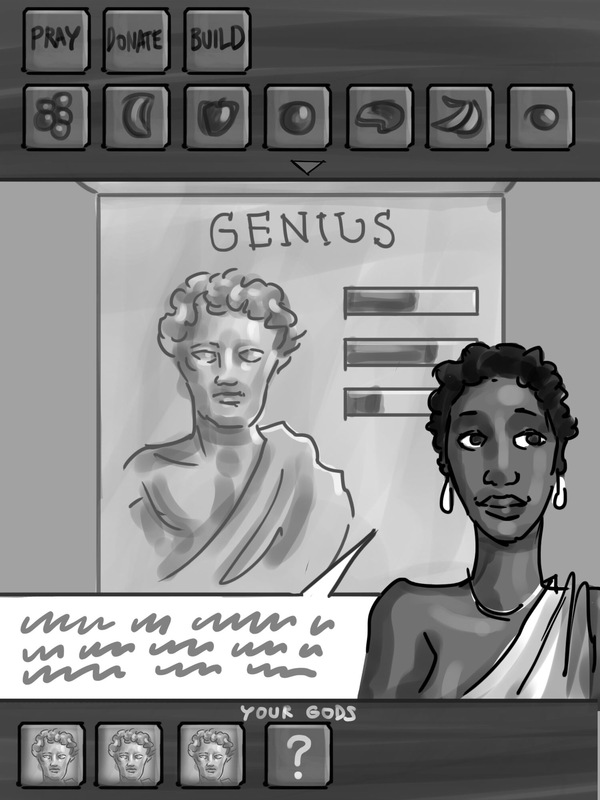 I could offer very little technical help, except to tidy up a crop of one of Juan’s sketches to create the Lucia interface, and edit Edwiges (very good) English for the game’s intro panel and our submission materials and Paradata. But as it turned out that extra layer of interpretation was a very positive addition to the finished product. Because we did finish it, and at four in the afternoon on Saturday we were able to present a finished, playable version of the first level of the game to our fellow Jammers and the judges. Yup judges. I’d not realized when I first signed up that the Heritage Jam was a friendly competition. And even though I twigged that before I actually attended, I’d not gone with any hope of winning. Next time I’ll write about the other projects, all of them were brilliant and stiff competition. @HeritageJam 2015 diary 5 – Twine, how do I hate thee? Let me count the ways. Short post today, to scream my frustration into the aether. You recall that when Team Oakleaf got together, we had a bit of a confusion over Twine 1.4, which I’d written in, and Twine 2 the shiny new version, which my teammate had downloaded. I hadn’t done much in my version, so we had the chance to choose which we should use. Cat left the decision to me, and the more experienced Twiner (! ), I plumped for 1.4 because the image and (particularly) sound handing seemed better in that version. So one we went, Cat has turned in a couple of brilliant aural models, one of which has to be heard to be believed. I got most of the way with the Twine until all I had to do was create a way for readers to change a variable, without linking to a new passage. Two days I’ve spent on that. Using up all the time I’d planned to work on my Team Infopointers project. 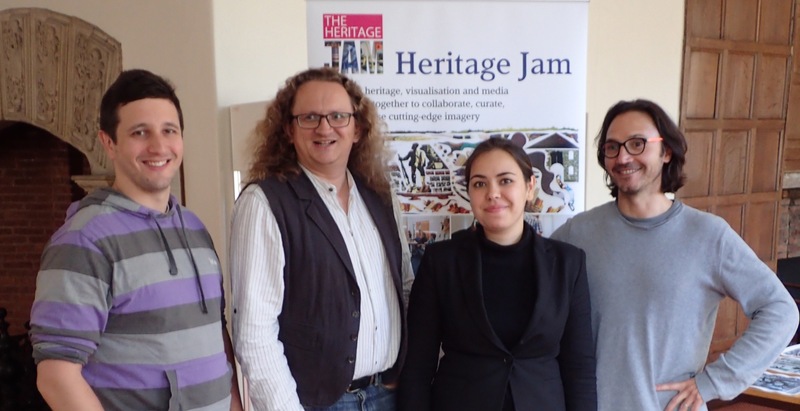 @HeritageJam 2015 diary 4 – two projects. Not as much progress as I’d hoped for this week. On Team Oakleaf, I spent last Sunday with a deck of index cards and a sharpie, breaking the story for a Twine game. The cards are still scattered, though more chaotically than they were across my dining room table. I had agreed with Cat, my Oakleaf team-mate, that one the job was done I’d type it all up in Prezi to share with her. But as I sat at my lap-top (which no-longer seems to be charging – I need to look into that), I thought that the time I spent typing text in Prezi would be duplicated when i came to type it into Twine. So, I spent the evening typing it into Twine instead, Cat would have to down load Twine sooner or later anyway, I thought. Job done, I saved it all into a DropBox folder (optimistically titled “Phoenix”)m and shared the folder with her. On Tuesday evening I turned to my other project for Team Info-pointers. My teammates had sent me a demo infopoint – a Raspberry Pi and a vicious looking high-end wi-fi adapter and other things. So I spend the evening preparing a system card with Raspian OS and Wireshark (including dumpcap), then firing up up the Pi and (step one) putting the wifi adapter into Monitor mode. Not all wifi dongles are capable of this, and Windows machines especially don’t build in the ability. Despite being a GUI interface, its not the most intuitive, so much of the evening was spent finding my way around the Wireshark software. What I couldn’t work out how to do, was have any impact on the wifi adapter itself. It sat there, glowing blue but refusing to respond to anything I clicked on. All the while the Monitor Mode checkbox sat ghosted and unclickable. So I spurned the comforts of the GUI interface and turned to the Command Line. Still no luck. Just the smug blue glow of the adapter. I emailed my troubles to team-mate Paul and went to bed. When Paul replied with the correct CLI syntax, I went straight there and typed it in. Aha, the (blue) light was on, but no-one was home. I swapped out the adapter for the cheap one from my boy’s Pi. As a booted up the project Pi, the little blue LED blinked and chattered away. The baleful blue of the fancy dongle was not smugness after all, but a lonely, dumb plea for someone to talk to. I was missing a driver. So I spent the morning working out what was missing. All I needed to do was “apt-get” firmware-Linux-free. No problem! Problem! Can’t get on-line! So, I swap the dongles again, download firmware-Linux-free, and then restart with the fancy one. Success! I work out how to change the Time coloum to record UTC, hours minutes and 100millionths of a second, set the Source MAC as the next column, and then I crate a new column to record RSSI (which interestingly is a negative two digit number). I set it sniffing. Now with the adapter working in Monitor mode. I turn back to Team Oakleaf. Cat has downloaded Twine, but can’t load my draft. I try to do the same, downloading Twine onto my Mac and indeed, I can’t import my own draft story into it either. Slight panic as I fear the story saved on Sunday evening may have been corrupted. The I realise – a new version has come out since I last used it. I wrote the story in Twine 1.4 and I’ve downloaded Twine 2. And the two are incompatible. I assume Cat has done the same thing, and email her. 1.4 is still available, she can use that to take a peek at what I’ve done. But now a conundrum, do I replicate my work in a new Twine 2 story or, as cooperative working seems slightly easier in Twine 1.4, should we stay in that?